Made with 100% Skintex leather, our elite standup shin guards&rsquo combines comfort and great durability at an affordable price. Providing pro-anatomical reinforcement on the important key areas &ndash shinbone and instep &ndash delivers ultimate protection and optimal striking surface. The 2 large Velcro straps and the elastic bands placed under the foot and heel ensure you a secure custom fit. Technical Features: Premium Skintex leather construction. 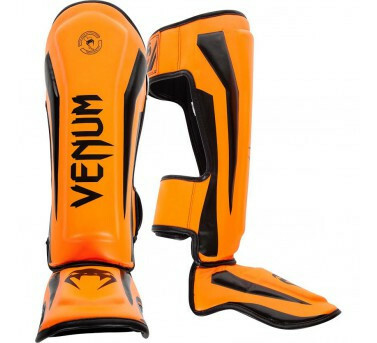 High density foam with additional padding (shinbone and instep) for enhanced shock absorption. Lightweight design providing unrestricted mobility and speed. Large Velcro straps for a no-slip fit. Embossed label and slick graphics. Handmade in Thailand.